The multi-state pact will allow players from New Jersey to participate in WSOP.com bracelet events for the first time. ESPN and Poker Central have announced the preliminary schedule of the live coverage of the 2018 Main Event of the World Series of Poker. Beginning on July 2 and continuing every day through the conclusion of the event on July 14, ESPN will air no less than 40 total hours of live play across both their ESPN and ESPN2 channels. This year, ESPN is adding to their hours of poker coverage by showcasing the massive $1,000,000 buy-in Big One For One Drop tournament immediately following the Main Event on July 16-17. For all of the action that ESPN doesn’t cover, Poker Central’s PokerGO paid streaming service will be providing hours of auxiliary action. While the PokerGO schedule for the World Series of Poker will be announced at a later time, fans can expect plenty of additional hours of in-depth coverage, as they provided in 2017. In addition to the live coverage, ESPN will continue to produce the more traditional episodic re-telling of how the Main Event unfolds. 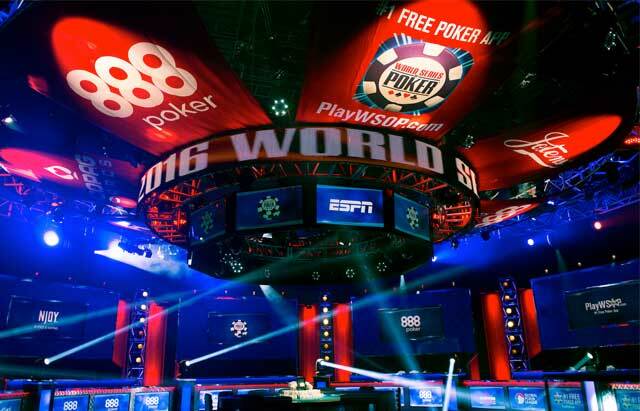 The current contract between ESPN and the World Series of Poker is currently slated to continue through 2020.